Thinking of taking some motorway driving lessons? At present, learner drivers are not permitted to drive on motorways. Which is why, when you pass, you will have no experience of driving on motorways. Speeds are much higher on motorways and there can be much more traffic all travelling much faster than you are used to. That’s why your decisions need to be the right ones. There are far fewer crashes on motorways than any other road, but when a crash does happen, the consequences are likely to be far more serious. We have plenty of motorways in our area to practise on. Gain your confidence and go where you want, when you want; the Trafford Centre, Chill Factore, Blackpool pleasure beach, shopping in Leeds, wherever takes your fancy! 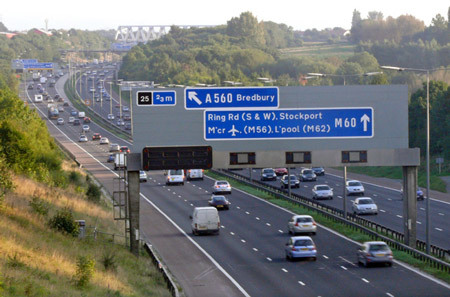 Our driving instructors are based in and around Oldham, so if you are looking for a motorway driving lessons in Oldham, Rochdale, Chadderton, Middleton, Ashton-under-Lyne, Failsworth, Saddleworth or North Manchester, get in touch! Ready to book that motorway session now? Call us on 0161 410 1011 (lines open 9am – 6pm, Monday to Friday) or fill in our contact form.